Embroidery is a form of decoration that uses thread to ‘paint’ a design onto a fabric. It has been used by people for thousands of years. Pieces found in China have been dated back to as long ago as the 3rd-5th century BC! Throughout history embroidery has been seen a symbol of status for two main reasons. Firstly, it’s difficult and time-consuming to produce. And secondly, it’s really cool- not only can you apply colors to fabric to create pictures, but depending on how you lay the stitches down you are able to create texture and dimension as well. Embroidery is a tradition that we really enjoy and are proud to continue. It is thought that all of the techniques we use in modern embroidery had their origins in learning to make and repair clothing in ages past. The biggest advances have only come in the relatively short time since the industrial revolution began. Machine automation and computer aided design have allowed us to reliably create and reproduce extremely sophisticated designs at rates unthought of centuries ago. The materials currently available to use now are equally incredible. 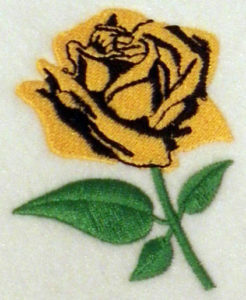 We are proud to offer specialty embroidery techniques and materials. We can create designs for you that utilize Applique Fabrics, Tackle Twill, Metallic Thread, Glow-In-The-Dark Thread, and 3D Puffy Foam. We are constantly looking for new ways, and new things, to embroider and print. Contact us if there’s something special you have in mind! It never hurts to ask! We have incorporated the latest in computerized networked embroidery technology to allow us to scale our operations as needed, while still efficiently handling smaller orders. In an effort to ‘Keep it Local’ we have made the conscious decision to source our materials and supplies from vendors and manufacturers based in the United States, and more specifically New England and Connecticut whenever possible. The engine of our economy is here, and we need to do our part to strengthen it. Subscribe to our mailing list for updates and special offers!